Charcoal fires give your food an authentic smoke taste. Many say that the flavor from charcoal and pellets tastes just as good as the almighty wood-fired smoked flavor. Not only that, you can get pellets or charcoal anywhere and at any time, making them more convenient than wood. Charcoal, pellets and wood take longer that traditional grilling or baking does, but the wait is worth it. Most people recommend having some wood on hand to burn on top of the charcoal. However, vertical charcoal smokers require less wood than traditional smokers do. Their compact designs make them a better option for people with less room for their cooking than side-mounted offset charcoal smokers. 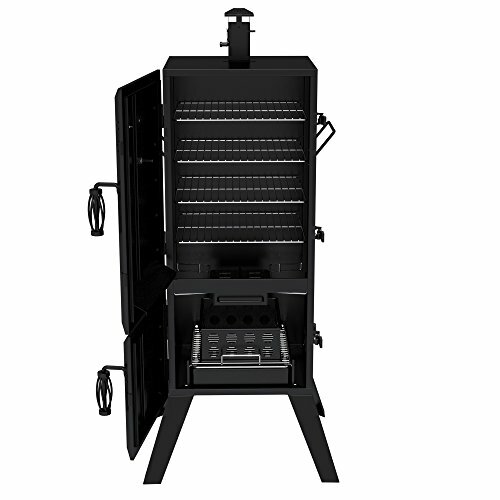 If you plan to smoke a lot of food, this Dyna-Glo vertical offset charcoal smoker will do the trick. With a 1,176 square-inch cooking area, it can smoke up to 150 pounds of food at one time. You can feed the whole neighborhood with that much space! If you need to move the smoker, you won't need to sweat too much. It has handles on each side, making it easy to pick up. 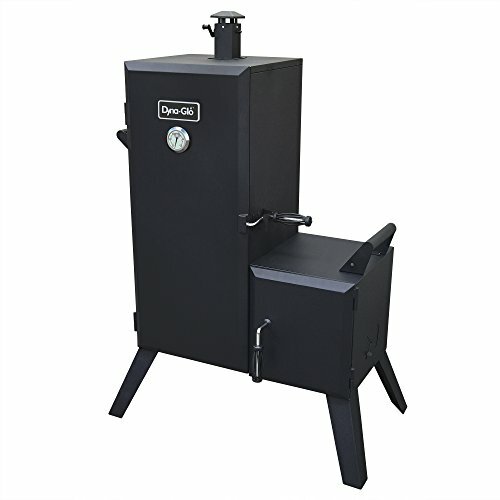 One feature that makes this Dyna-Glo smoker stand out is its offset firebox. This reduces the heat levels that come across your food, allowing you to keep more flavor and avoid charring. Cleaning up this smoker is surprisingly easy. It has a grease management system, which collects grease drippings and condensation that build up inside the food chamber. You can just wipe down the smoker and not wear yourself out getting rid of residue. Masterbuilt typically engineer their smokers to last a long time. This vertical charcoal smoker is no exception. This smoker has less cooking space than the Dyna-Glo DGO1176BDC-D does, but it's still a good option for a small or medium-sized family. Its two chrome cooking grates let grillers smoke up to 50 pounds of food at a time. The Masterbuilt 20060516 has a dual-door design (known as “cabinet style”). You can check on the fire and charcoal without losing any heat. Consequently, you can cook your food in less time. This Masterbuilt has a temperature gauge built into the door at eye level. You'll be able to get an accurate temperature measurement–always important when you're smoking meat–instead of winging it. 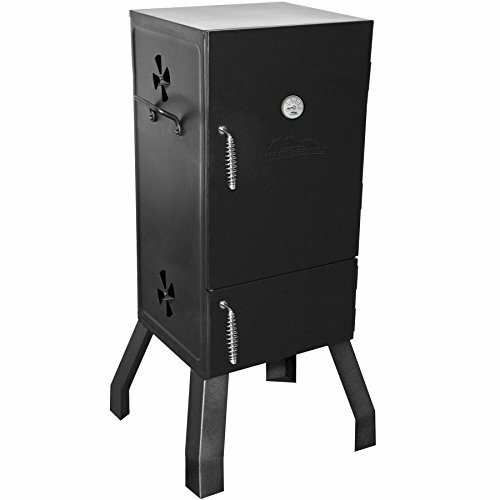 Overall, this vertical charcoal smoker from Masterbuilt can get the job done without taking up much time or space. Similar in size and design to the Masterbuilt, the Char-Broil vertical charcoal smoker has 3 adjustable cooking grates and about 365 square inches of space. This smoker is easy to maintain. Its pullout drawer intercepts and stores ash. When you need to clean it out, you can simply pull the drawer open and remove the ash. Another helpful feature is the smoker's porcelain-coated, slide-in water pan. If you aren’t familiar with smokers in general, water pans add moisture to meat as it’s cooked. This keeps meat from drying out, which tends to happen at high temperatures. You won’t need to worry about burning yourself either. The Char-Broil vertical charcoal smoker has cool-touch handles on the door, which let you get a good grip on the grill lid without harming your hands. It's a little harder to control the temperature on charcoal smokers than on gas devices, but you can do it with come careful monitoring. Here’s another vertical charcoal smoker from the Dyna-Glo brand. 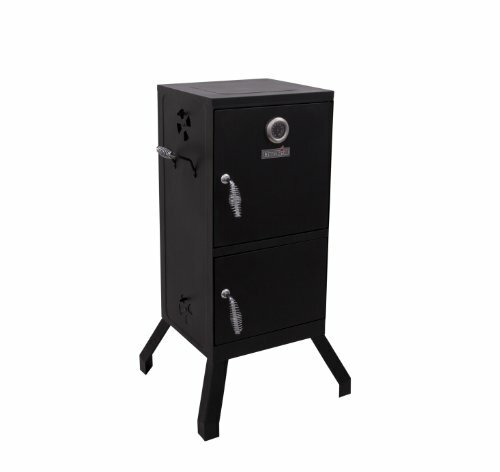 Unlike the DGO1176BDC-D, this one is more of a standard vertical smoker. It offers less room but still has everything you need to perfect your meats. 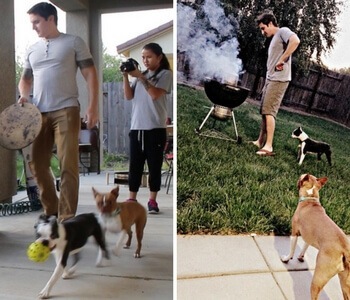 Its four cooking grates take up approximately 784 square inches of total cooking area. The Dyna-Glo DGX7808BDC-D has a charcoal and ash management system, making them easy to clean. This system consists of a removable ash pan, a charcoal grate and a charcoal chamber. It allows you to separate the charcoal and rid ash that accumulates over time. This model also comes with such convenient features as a chimney, a temperature gauge and small footprints. The temperature gauge on the top of the smoker lid is easily viewable. The smoker's small footprints allow it to fit nearly anywhere. 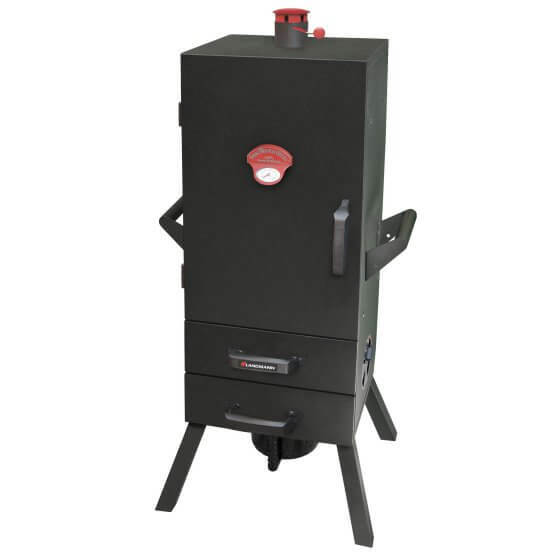 The Landmann vertical charcoal smoker can give your chicken, steak and fish that delicious wood-smoked taste. It offers 3 cooking grates and almost 700 square inches of cooking area. Its air damper vents and a chimney make it much easier to control the heat within. Like other smokers on the list, the Landmann has cool-grip wire handles that keep your hands from getting burned. Its 2 easy-to-access water and wood chip drawers let you keep your cuts of meat moist and give them that wood-smoked flavor. This Landmann smoker is very durable too. Its heavy duty steel will keep rust away for years. This makes it a good long-term investment. The first thing to consider when looking for a vertical charcoal smoker is the number of people you'll be cooking for. Some smokers are built for large groups, some for small groups, some for just one person. You don't want to buy a smoker that's too small; otherwise, you could end up smoking food all day. Next, consider the price. If you're on a tight budget, the Char-Broil and Masterbuilt smokers will be your best bet. If you need something a little bigger than these models, the Landmann's a good option. If portability is a concern, consider the size of each smoker as well as features like side handles. Also, most vertical charcoal smokers have narrow legs, making them easier to pick up from the bottom. Finally, see if a smoker has an integrated temperature gauge. This feature can save you from worrying about finding the right cooking temperature. It lets you know how long it’ll take to get your food ready. Regardless of which fuel they use, smokers are meant to give your food that authentic smoked taste. Vertical charcoal smokers may require more attention, but the flavor you get in the end is definitely worth it. Charcoal smokers take longer to heat up than propane devices. You'll need to wait for the charcoal briquettes to turn grey before cooking. You'll also need to watch over it more, which could prove daunting for less experienced grillers. However, your food will have a much smokier flavor. The biggest advantage of vertical charcoal cabinets over charcoal barrel smokers is that you can access charcoal and food separately, which prevents contamination. Their cooking grates are stock on top of one another, which lets you add more food. Some models are rather narrow, but this can come in handy if you don't have much space in your home. Durability is another major consideration. A few vertical charcoal smokers are built with thick, high-quality steel, which makes them last longer. It also keeps less smoke and heat from leaking out, enabling you to heat up charcoal briquettes and cook food faster. Hopefully, the info here will help you weigh your options and find the best smoker for you.